Need more information about booking Home 5778 ? Possibly the best part of your holiday here has nothing to do with the cottage. It will be the ease at which you will be able to turn off and forget the stresses of everyday life. The location, the climate, the freshness of the air, the fantastic fresh produce and meals, and most of all the great people you will meet without even trying, all contrive to ensure a truly memorable holiday. This cottage is ideal for couples or those with a small family who love the countryside. It is spacious and benefits from air conditioning, a fully fitted kitchen, and wifi. Upstairs your King size bed has crisp Egyptian cotton linen and your large shower is just right after a hard days 'holidaying!! The village itself, is in the beautiful Sierra de Aracena and is definitely in 'rural Spain' with several family run bars and restaurants, all serving freshly prepared Spanish tapas and tasty meals. An ideal chance to brush up on your Spanish if you want, although the villagers are incredibly friendly and so willing to make you feel at home.. You will have a Flat screen TV, a DVD player, and loads of films as well as books, Cds and games. During your stay you can go and pick as many fresh seasonal vegetables as you wish from our large 'huerta'. In summer these include onions the size of bowling balls, the tastiest tomatoes ever, green and red peppers, zucchini, cucumbers and the list goes on...If you would like to really kick back, we can provide breakfast or breakfast and dinners, just ask.We provide a welcome pack including wine, beer, milk, homemade fresh bread, butter, orange juice, tea, coffee, sugar, homemade Seville orange marmalade, eggs and Spanish produce. If you come on a Sunday, or bank holiday, I am happy to do some shopping in advance for you. A warm woodburner in winter. cool thick walls and airconditioningin summer, all help to make this an all year round hideaway holidaytwhere you can relax and unwind. The views from your windows are over the village and to the Sierras. There is secure private parking on our land so no need to have to find a space. The old thick walls also help to keep the house cool in the summer and warm in winter. Your kitchen is spacious with all you will need if you enjoy cooking. The fresh produce here in rural Spain has so much flavour and you are welcome to pick the garden seasonal vegetables for your cuisine. Our free range chickens provide the best eggs with bright orange yolks and you may enjoy feeding them along with our sheep that eat from your hand. You have a private sun terrace that faces south and is a real sun trap in the day and with soft lighting in the evening it is an ideal spot in summer to enjoy a few drinks or your dinner. There are sun loungers, a table and chairs, a shaded area and large umbrella. Surrounded by potted flowers and shrubs, it is a lovely area to relax. Alternately you may like to sit in our large garden under the palm trees and while away lazy afternoons. This Cottage has 1 bedroom, 1 bathroom and sleeps 2. It’s been listed on Holiday Lettings since 24 Mar 2005. Located in Province of Huelva, it has 23 reviews with an overall rating of 5. The average weekly rate is £287. The Owner has a response rate of 100% and the property’s calendar was last updated on 02 Apr 2019. A great break to celebrate my 40th. Mike and Fran were the perfect hosts; sociable, generous and a great source of local information - they genuinely care about making your stay as enjoyable as possible. The village itself is lovely and the people friendly even if your Spanish is, like mine, limited. The bars all serve good quality food and drink at good prices. The area is stunning and we hope to return here to the house sooner rather than later. We were thrilled to find this gem of a property and experience real Andalucian Spain. 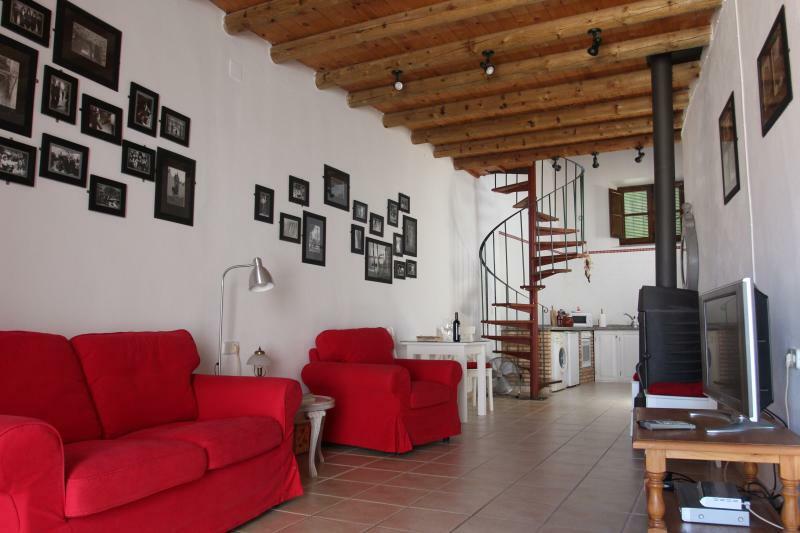 The cottage has great character with exposed stone walls,spiral staircase, wooden shutters and a little terrace in which to grab some sun or have a evening drink . Evaristo had everything we needed and we were greeted with a lovely welcome pack of food and drink including eggs from the owners chickens. Fran and Mike are the loveliest of hosts - and went out of their way to ensure we got the most from our week. .The local fresh water lake is10 minutes drive away and was a real find. The town of Aracena is a 5 minute drive and is beautiful with cobbled streets and white washed houses. This is a great base for walking with lots of old donkey trails to explore. Sevilla is only an hour's drive and is a must visit location. We will definitely be back to explore more. We spent a week here in January 2013 and although the weather was not the best we still enjoyed ourselves. The house itself was very cozy with a great wood stove and the most ingenious 'under-the-table-heater' that we saw nowhere else during our 75 day stay in Spain. The bed was super comfortable and the upper floor was bright and warm. The kitchen was very well equipped with cutlery, pots & pans and cooking essentials/basics. The welcome pack of bread, fresh eggs, bottled water, butter, jams, juice and a bottle of wine was quite unexpected and much appreciated. We did not have a car but managed very well thanks to Richard and Lynn who were holding the fort while Fran and Mike were away. They were very welcoming and approachable. Richard picked us up at the Aracena bus station, delivered us back there for our return to Seville, took us into Aracena for tapas and drinks and to meet their friends who agreed to walk one of the trails with us. We loved all of the four walks we did in the area and also enjoyed the village itself; the small shops; the veggie and fish vendors right outside the front door; the delicious potato chips from the tobacconist; the shop owner who said I could pay her the next day as she was in a hurry to close up; Bar Jesus; and the fresh eggs and oranges from the hens and trees on the property. We would definitely stay here again, but later in the year when it is warmer and drier. Where do I start? The location is up in the hills, far from the madding crowds! Beautiful treks, tasty, well priced food, local hospitality, villages and towns serving beer and coffee for a euro!!! The house is kept beautifully, new furniture, clean and wonderfully cool despite the heat outside ( also heaters and fires for a cozy winter feel too). Fran and mike manage the property as if it's their baby. Visitors are made to feel really special and there isn't enough these fun, genuine and knowledgeable hosts won't do to ensure your stay is wonderful, whatever your objective of going may be. We had a barbecue in their garden, eating the best pork I have ever tasted, a golf putting competition in the garden, endless beers in the garden... A lot in the garden it seems! If you want to be independent that is catered for, if you want local ideas and input that is catered for also. I took my year old and all baby stuff was provided and Fran took my daughter to feed the sheep and chickens etc and made sure she had a memorable time. Ideal location for us, through front door directly into the village. Through the back door into the farm of the hosts. Private if you want but handy to contact the owners if you need anything. The owners did everything they could to make our stay enjoyable. Our pet dogs loved them and the location. As far as we are concerned we made two new friends and will definately visit again in the future. The accomodation is spacious and comfortable. There is plenty to do in the area and Mikle & Fran gave top advice about where to go. Seville is easily reached by car and a worthwhile visit. We have already recommended this to our friends. One assumes that if you are looking for accommodation in this area of Spain that you have done your homework. If you are looking for somewhere with nightclubs, discos, karaoke bars and fast food joints serving pie & chips read no further. If however you want a comfortable studio with all mod cons (wifi is available but you will have to take your laptop near to the owners house due to the thickness of the walls) in a small white village that will make you very welcome then this may suit you. The house itself has everything in it that you need for everyday living as can be seen by the pictures on their website. If however you dont want to cook then any one of six bars in the village provide excellent food from tapa to full meals (remember the Spanish eat late so no problem getting a meal at night).. Mike & Fran the owners are always on hand should you have a problem or want any advice on the local area, they will also provide excellent food & even teach you some Spanish if you want to learn - again see the website. The local area has plenty of walks where you will see beautiful views, wildlife and birds. An hour or so drive will bring you to the coast which has some of the best beaches in Spain. Aracena the main town in the area with shops bars restaurants garages etc is only a ten minute drive or a nice walk if you feel energetic. There are plenty of other villages around to explore some within walking distance all with their own particular charm. If you are lucky you may visit during one of the fiestas, this means all night music and entertainment for three or four nights the townhouse is on the edge of the village so you can still sleep if you need to. The only people I wouldn't recommend the townhouse to are disabled - ( the spiral staircase is not wheelchair friendly or people with severe walking dificulties but I believe this is mentioned on the website. We love this place, the house the hosts & the village and have made some good friends - you just have to accept this is the real Spain not a tourist area. Very well equipped house lots of info and maps.Very comfortable. Fran and Mike such nice owners who are so helpful and provide a lovely welcome pack plus fresh eggs and veg from there garden.Lovely village and great area for exploring.Will soon be returning.